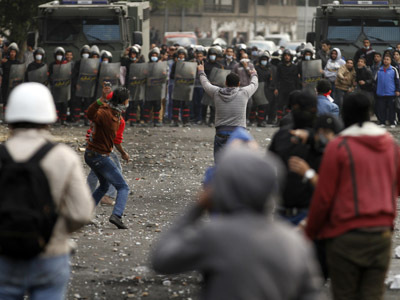 An Egyptian man millions saw being assaulted by police has claimed the officers were saving him from the demonstrators. Meanwhile, as police once again dispersed Cairo protesters, Egypt’s Minister of Interior has announced that he's ready to resign. ­Clashes between protesters and security forces continued on Saturday night as large crowds gathered around the Presidential palace, demanding the resignation of Mohamed Morsi. Fireworks and Molotov’s cocktails were used by the demonstrators to battle police, who used tear gas and warning shots to quell the crowd. 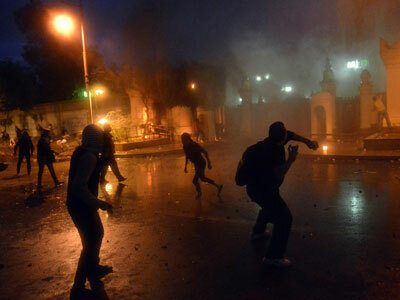 It was the second day running of violence in front of the Palace. Police on Saturday announced that they made 20 arrests, and were filmed beating and dragging a naked man into a van, enraging President’s Morsi's critics who compared the incident to methods used under Hosni Mubarak. ­On Saturday, Mohamed Ibrahim announced that he was ready to resign if that was the wish of the people following an upsurge in violence. In his statement at a press conference, Ibrahim assured that an investigation had been opened into Saber’s case and it would be transferred to the public prosecutor to hold those responsible to account. He added that he ultimately took responsibility, but warned if the ministry collapsed it would pave the way for militants to take over the country. ­A picture can tell a thousand words, not in a case of Hamada Saber, the man who has made global video headlines as he was assaulted by Egypt’s security forces Friday night. The man claims it was the demonstrators that "initiated" the battering. The one and half minute video shows a naked man repeatedly assaulted by police, beaten with batons and dragged on the ground. But the fifty year old painter presented a different picture of the events that were recorded and aired by Al-Hayat satellite TV. Speaking from a military hospital, where he was being treated, Saber claimed that Central Security Forces (CSF) protected him instead of assaulting him, Ahram Arabic news website reports. 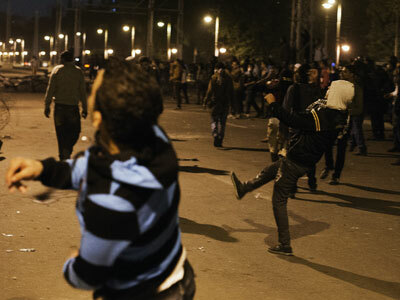 "I was standing at Roxy Square [near the palace] drinking a soda, when a large number of protesters who mistook me for a CSF officer because of my black attire attacked me and stripped me of my clothes," Saber was quoted as saying by the Ahram, adding that the crowd were angry as he tried to dissuade them from “firing bird shots” at the police. Saber has also appeared on State Television on Saturday and thanked the police for their role in the incident. 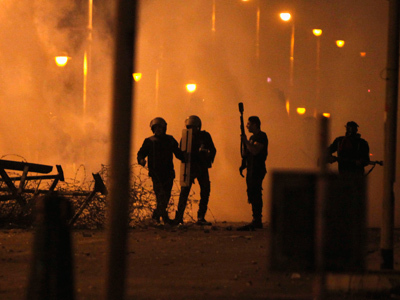 "The protesters fired an unknown bullet at me and robbed me. 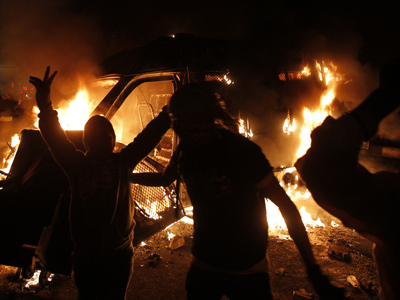 When I saw the CSF soldiers coming at the crowd, I was scared and I ran. The soldiers chased after me yelling they wanted to help me. When I fell, they caught me and said: 'you gave us a hard time, man.'" Saber’s wife has also allegedly sent a message of gratitude to the ministry of interior. "The police are very respectful and are standing by our side, and the minister's assistant for human rights has visited and will come again tomorrow [Saturday]," Fathya Saber told ONTV satellite channel. In an interview with Al-Hayat TV, Saber said the riot police had a valid reason to treat him violently as he was resisting an arrest. Asked how the police saved him, Saber replied “I know what is in my best self-interest. Do not make serious problems for me." In the meantime, the main opposition group, the National Salvation Front has called for Interior Minister, Mohammed Ibrahim to resign over the assault. ­Many Egyptians are not convinced Saber’s statement about the police rescuing him is genuine. Critics of the government claim the fifty-year-old was forced into confession through torture. "We feel sorry for him because he was tortured in front of the world then he was mentally abused into lying about the facts inside of the police hospital in the absence of any lawyers," Mohamed Zaree, the head of the Arab association for Criminal Reform, has told Ahram. Zaree also added that he and other lawyers were not allowed access to Saber as they apparently lacked legal credentials. "President Mohamed Morsi and the minister of interior are solely responsible for the carrying out of systematic torture which violates all international codes of human rights," Zaree concluded.